Breaux Vineyards located in the hills of Purcellville VA. The winery offers a unique wood paneled wine room for the groom and his groomsmen while the bride has a well appointed bridal suite just off the reception hall. Many couples choose this winery as the location for their ceremony and reception. From the rustic Cork and Key Room to the sun filled Acadia room with views of Lafayette Terrace and it's mountain landscape among the vines, there's no doubt you'll find a space that is perfect for vowing your lives together. 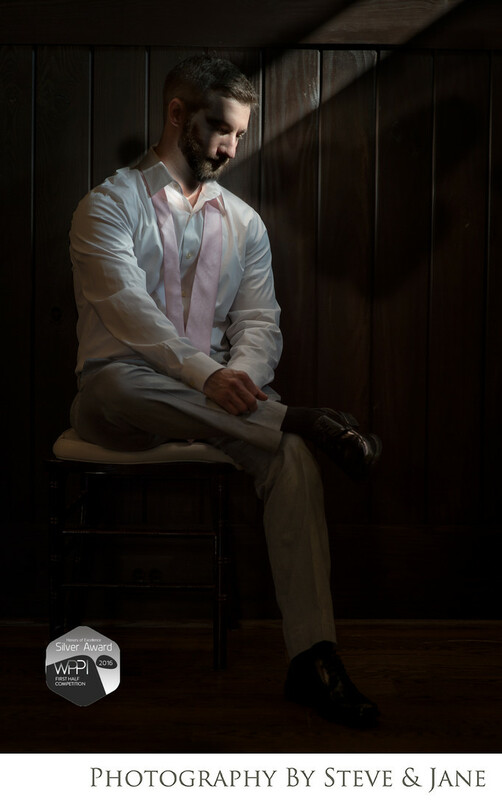 Be sure to have the site coordinator sneak you down into the wine cellar for portraits among the barrels of wine. The main building is a tuscan style. When you visit to plan your wedding, make sure you have plenty of time to stop in for a tasting and a tour of the facilities. This also gives you a chance to pick out the perfect wine to serve to your friends and family during your cocktail hour on the day of your union. This photo was captured in the Cork and Key beneath the bright and airy, yet elegant Acadia Room. It was merited a silver award from Wedding and Portrait Professionals International, also known as WPPI, in Fall of 2016. Location: 36888 Breaux Vineyards Ln, Purcellville, VA 20132.